Weekly News: Art work created from weekly news items from the media or news items that we make through protest. 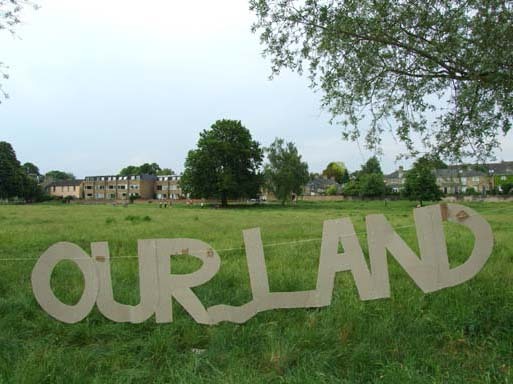 Currently I am researching the theme of land, investigating common land and land ownership and looking at areas of local shared grassed land in detail. In parallel with this I have also been examining contemporary issues concerning housing and home ownership. This research based, theoretical work has resulted in the production of art work in a range of media, including painting, photography, installation and text based work and combinations of these. For example, I am currently working on a detailed painting of a sample square quadrat of shared grassed land, which can be seen from the flat that I live in. I have also been collecting pieces of everyday furniture, evocative of my childhood and I intend to grow grass on them and create small ponds within the furniture. This work is typical of me in that it is heavily researched based, focusing on a particular social issue or political theme and involves a range of media, including painting, text and photography.